An effort to remove sexual assault cases from the military chain of command received a bipartisan boost Tuesday as conservative Republicans joined the bill's main backer, Democratic Sen. Kirsten Gillibrand, to voice their support for the measure. “Our carefully crafted common sense proposal was written in direct response to what the victims told us, the stories that came from them, what happened to them, the fact that they didn’t trust the chain of command, that they were retaliated against, that they didn’t think justice was possible,” Gillibrand said at a Capitol Hill event. The proposed law comes after a spike in sexual assault cases in the armed forces, which has prompted President Barack Obama and top military brass to vow change. A report Monday from a government watchdog found that in many cases the military did not properly investigate sexual assault claims. 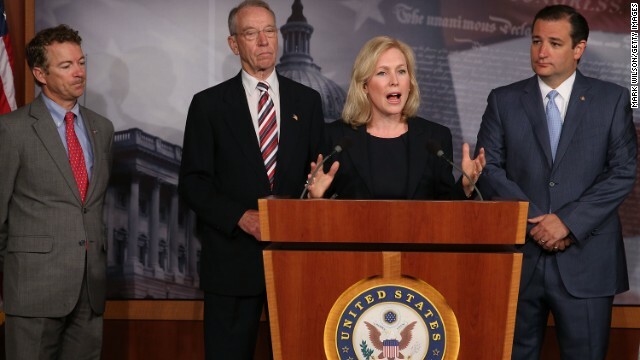 The bill is an extension of Gillibrand's efforts in the Senate Armed Services Committee to advance legislation requiring decisions about sexual assault cases to be made by independent military prosecutors. The measure faced opposition from senior military leaders, who argued it would harm commanders' ability to lead effectively. Now it appears that these Conservative fanatics are trying to make themselves look good by jumping into this. This kind of activity that these military men engage themselves in should never be permitted anywhere, anytime! Too many been getting away with too much!! !